5Point Adventure Film Festival is entering its 11th year in Carbondale where we screen more than 50 films and hosts dozens of filmmakers and athletes from around the world, creating an inclusive gathering of our outdoor and creative communities. A celebration of bikes & the people who ride them. 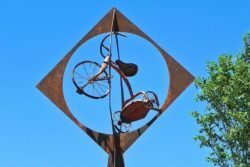 CarBondale without the “car”, Bonedale Bike Week is a week long celebration of the best way to get around Car(LESS)bondale! Contact Eric Brendlinger at 970-510-1277 for more information.